New York: Melville House, 2013. A friend on Facebook recently alerted me about a pen and writing show coming to Toronto: Scriptus. “Dangerous?” she asked. “Dangerous” does not begin to cover it. I need another pen like I need a hole in the head, but my superabundance of writing supplies never seems to stop me from looking at/for more. The rainbows of coloured stationery! The many hues of ink! The tactile joy of letterpress printing! This obsession of mine would be a lot more fun if I could share it with my near and dear ones, but the children really are not all that keen on pens and writing. Eldest (13) was never really taught how to write, and neither print nor cursive was taught with any rigour. I learned my lesson and made sure that Middlest (9) and Youngest (6) at least learned the stroke order for making letters. Middlest learned cursive in school last year, but has, of course, reverted to print since no one requires cursive of him. Do I want to be the mother who makes her kids do handwriting practice at home? 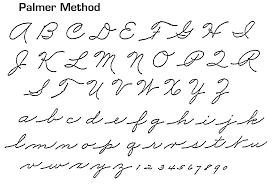 Well, I want to be the mother of kids who will go into adulthood able to write cursive. So … I bought the Handwriting Without Tears books and have made stabs at teaching them at home. When we can. Sigh. Not often enough. I can see why it has fallen to the wayside at school: there are always so many other things to do. I’m beginning to think we may have to compromise: 15 minutes of handwriting practice in exchange for 15 minutes of screen time…. 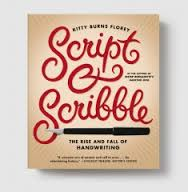 Like Philip Hensher’s The Missing Ink, Script & Scribble (originally published in 2009, reissued by Melville in 2013) traces not only the history of the development of handwriting, but its demise as well. It is a wonderful mix of memoir and history, and I loved the balance she found between the two. There’s a wonderful history of writing implements, and she’s introduced me to new and dangerous wonderful places to find writing goodies. Each generation’s writing got a bit less ornate, a bit less fussy. Until today, when the majority of kids will not have a cursive hand to call their own (insert grumbling here). I have to admit that although I love the Handwriting Without Tears philosophy and method, I find it to be by far the least attractive of the lot. But given that handwriting is no longer part of the curriculum (insert more grumbling here), it’s the one I brought home. The prescription? She practices with an adult instructional book on Italic handwriting, which more or less brings us back to medieval Europe and the hand of Italian clerks, and she watches her writing go from “embarrassingly clumsy to terminally cool.” Medieval roots, yes, but look! Look at how lovely, stylish and easy to read it is! And, like HWT, the Getty-Dubay instructional system comes in a six-book set! I think it’s terminally cool because it looks more like the cursive that is still taught in England and Europe, where loops and scoops were never part of the prescribed method of writing cursive. And if I can bribe encourage Middlest and Youngest to learn this style of writing, they, too, will be terminally cool. 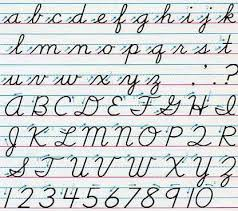 As I learned when I took part in CBC Radio’s segment on cursive writing, discussions about the value of teaching cursive handwriting are all over the place these days. If you are interested in reading more about the great handwriting debate, you could not do much better than Philip Hensher’s The Missing Ink: The Lost Art of Handwriting and Why It Still Matters. It is a lively, humorous and informative look at the history of handwriting instruction. Although it is written by an Englishman with a focus on handwriting instruction in his home country, there is a lot of information about the developments and reforms to the education system on this side of the pond as well. Reader, I too longed to copy the hand of my neater and more sophisticated friends and teachers! I went so far as to enlist friends in the task of labeling my notebooks and binders so that they would at least look beautiful from the outside. Hensher had me at “Hello,” but he really seals the deal with his chapter on his pursuit of the perfect fountain pen. He shops all day to find the instrument that will meet all his needs, and he finds that, in spite of his readiness to drop a fair bundle of cash on a truly good pen, the only pen maker who makes what he wants is the same pen maker that made his favourite $5 plastic fountain pen. Reader, I have been on a life-long pursuit for the perfect pen! I have shopped in England, Ireland, America, Canada and Japan, and despite having accumulated enough gel pens to stock the whole neighbourhood in this back to school season, I have never met a pen to beat my all-time, cheap favourite: the Uniball Vision Elite in blue-black. Why, after repeated confirmation that this is the perfect writing instrument, do I keep looking? Such is the fickle heart of the pen addict. Hensher does not simply write about personal anecdotes, of course. His main task is to trace the instruction of handwriting from the near-impossible eighteenth-century copperplate cursive to the much more legible and child-friendly methods of the mid-twentieth century. There are also chapters on Dickens’s writing, on the instruction of writing in Germany, on the history of the Bic pen, and on writing and psychoanalysis. There is also a three-page footnote on the use of coloured inks. The Prince of Wales uses purple. According to one old survey of 25,000 samples of handwriting, Lady Novelists use green. None of the lady novelists of my acquaintance use green ink, but there you go. O Tempora, O Mores! Hensher ends the book with a ten-point manifesto for why we should all learn and take the time to use cursive. It’s a thing of beauty. And it’s not just a utilitarian account of how cursive makes us smarter. It also makes us us, unique and inimitable.